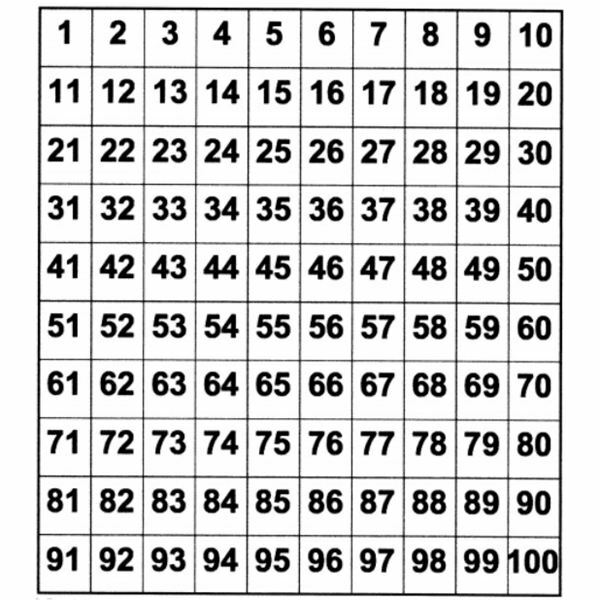 One of the most valuable tools you can use when teaching math is the hundreds chart. It is simple yet powerful. Hang one up in the classroom and provide individual copies for students to attach to their math journals or notebooks. I even heard a teacher say she hangs it over the sink in the student bathroom. Learning can happen everywhere! Large hundred chart for the classroom. Purchase at an office or educational supply store. 1. Use daily within your morning routine. Mark off one number each school day. Then count from 1 to the last number marked off. Practice counting by 10’s pointing to each number when you say it. Study the hundred chart. Do you notice a pattern in each column? Do you notice how many numbers are in each row? 2. Use the chart to compare two numbers. Put your right index finger on one number and your left index finger on another number. The number closest to zero is the number with the lesser number. Then, as an example, say, “27 is less than 35." Or say, “35 is more than 27." 3. Print out 100s chart on construction paper. Using the lines, cut the 100s chart into six to 10 pieces to create a puzzle. At a center, students practice putting the 100s chart back together. 4. Use the chart like a number line to learn addition. For example, “What is twenty-five plus three?" Put your finger on the number twenty-five and then count up three numbers and you see that the answer is twenty-eight. 5. Use the chart like a number line for subtraction. For example, “What is forty minus two?" Put your finger on forty and count back two to see that the answer is thirty-eight. 6. Use the hundreds chart as a game board. Two players put markers on the number one. Then take turns rolling the dice and moving that amount of spaces. They must be able to say the number that they land on. Set a timer and when it goes off the player who is on the highest number wins. 7. Place ten small hundreds charts on the floor in a line to show 1,000! Can we count by hundreds to get to 1,000? Place your marker on number twenty-five. Move to the right four numbers. Move to the left three numbers. What number are you on? 9. Use a blank hundred chart and fill in a few of the numbers randomly before you make individual copies for the students. Their assignment is to finish filling in the chart correctly. Make some other designs similar to #10.